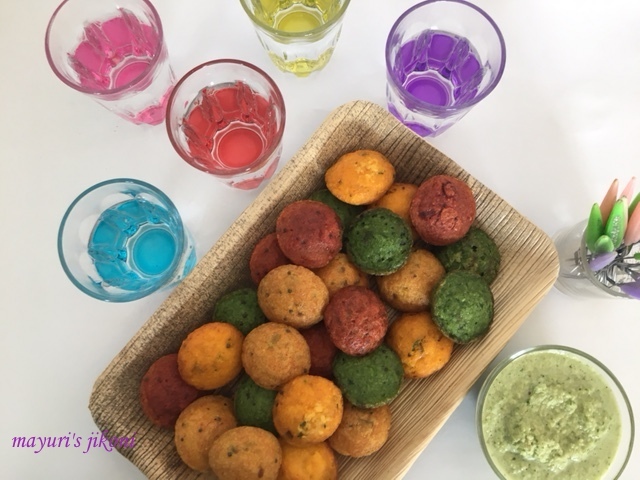 The Shhh Cooking Secretly group decided on either fusion or multi-coloured Holi recipes as their February theme. My partner Janani Krishnakumaar gave the ingredients rice and vegetables.Janani is a blogger at Red Chilly Curry.A vegetarian blog, she has many South Indian recipes, Christmas goodies, festival dishes and much more.Check her blog out. After a series of sweet dishes one after the other (entertaining guests) I didn’t want to make any sweet dish or something unhealthy. Since I’ve bought the paddu or paniyaram pan(chatli), I’ve always tried out various types of paddus and other bhajia mixtures with much success. The only thing I still haven’t made was the original paddu or kuzhi paniyaram, using the actual idli/dosa batter. Since we do not get ready made batter here, it takes a bit of planning to make idlis, dosas, uttappams etc. I decided to go multi-coloured but in a totally healthy manner. I used natural colours to make the colourful paddus. Though you may not be able to make out the difference between the carrot ones and the turmeric ones, I tried to make one yellow and the other orange. I guess next time I’ll have to use more carrot puree. This year, I hear that there is a water shortage especially in Bangalore because of the lack of rains. As suggested by some of the residents of our apartment complex, its best to conserve water and play Holi in a more environmentally friendly manner… like with flower petals. Artificial colours are polluting our waters. Its time all citizens take some responsibility to make festivals more environmentally friendly. Here in Kenya too we are facing drought and water shortage. Are people going to be conscious about not wasting water and polluting the garden and plants with artificial colours, remains to be seen.When I was little Holi meant the burning of a small effigy of Holika, doing a small kanku tikka and that’s it.Pretty friendly to the environment! So here’s my recipe for Holi with natural colours. Janani thank you so much for the wonderful ingredients. My family loved the colourful paddus. What I like about these small beauties is that they can be served as finger food during a party (say like Holi!) or as a starter during a sit down dinner or as breakfast or to pack as tiffin. Wash rice and urad dal separately under running water. Soak them separately in warm water overnight. Add the fenugreek seeds to the urad dal and let it soak with the urad dal. Next day wash the dal and rice separately under running water. I use a colander or sieve for this purpose. Grind the urad dal first using just enough water so that the blades turn easily into a smooth batter. Then grind the rice again using just enough water to a smooth consistency. Mix the rice and dal batter.The batter should be a bit thick as you’ll be adding the vegetable pastes to it. Let it ferment for 6-8 hours depending on how warm the climate is. Boil just enough water in a small pan. Add the spinach leaves along with the stalk. Remove the leaves as soon as they wilt, using a slotted spoon. In the same water add the diced carrots. Cover and let it cook till done. Remove the carrots from the water. At the same time heat water in another pan. Add the diced beetroot and let it cook till done. Remove the cooked beetroot from the water with a slotted spoon. Grind the carrot, beetroot and spinach separately without any water to make purees. I used a mini food processor. Keep the purees in the fridge till required. Put all the ingredients for the chutney in a blender. Process to a coarse paste. Heat 1 tbsp of oil in a small pan over medium heat. When it is hot, add the mustard seeds, urad dal, chana dal and asafoetida. Pour the mixture into the fermented batter. Add salt, chopped onion, coriander, curry leaves, chillis, ginger and coconut. Mix the batter well. Now divide the batter into 4 parts. To one part add the spinach puree, to the second one add the beetroot puree and to the third one add the carrot puree. To the fourth one add turmeric powder and a bit of water or you may leave it white. Heat the paniyaram pan or chatli over medium heat. Pour a few drops of oil into each cavity. Pour a idli batter into each cavity till its ¾ full. Cover the pan with a lid and let the paniyaram cook over medium to low heat. The top of the paniyaram should appear set. Flip the paniyarams. Add a drop of oil into each cavity from the side. Serve the paniyarams with your choice of chutney. Use left over idli or dosa batter to make paniyarams. You can omit adding the vegetable purees. Serve the paddus with sambhar if you wish. Serve paddus with tomato chutney, podi masala or chutney of your choice. Healthy, colourful and perfect for this theme. These are really addictive. The colourful ones are perfect for the Holi season.Nice pics. Very catchy and coloruful paniyarams, just prefect to celebrate the festival of colours. Thanks Sobha. I love paniyarams as they are with less oil and can eat to my heart's content. Thanks Priya, I too was surprised how colourful they turned out as on cooking usually the natural colours become different. Thanks Prathima, I too was surprised how colourful the paddus turned out.